with my weekend kind of wide open, i made some plans with my sister-in-law kari yesterday. after working up a sweat with her at pure barre that morning and then grabbing some oatmeal and chicken salad at cafe jonah and the magical attic, we drove on over to amsterdam walk to scratch our creativity itch at dip ‘n dab. i had been to a similar place a few times before, and since i always seem to have a good time, i figured it’d be a fun way to get out and do something a bit different. 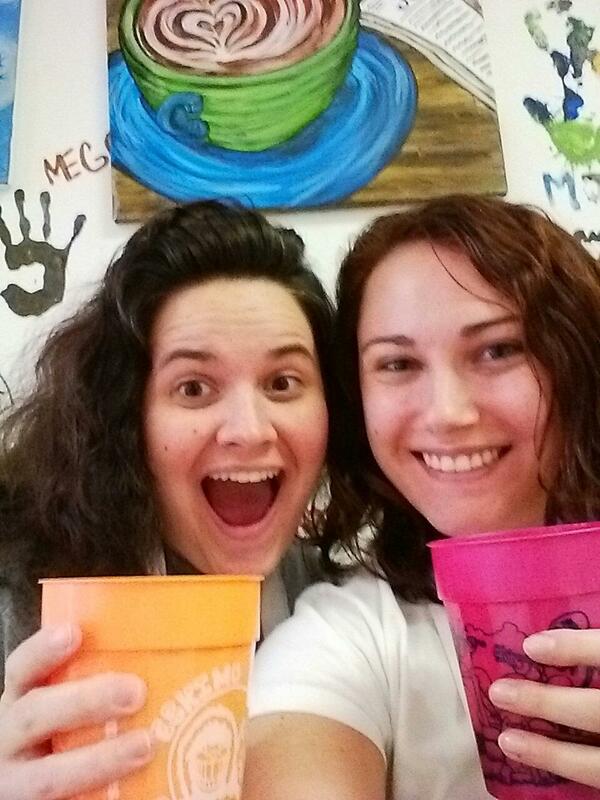 this was kari’s first painting and drinking experience, so i was excited to have her join me. 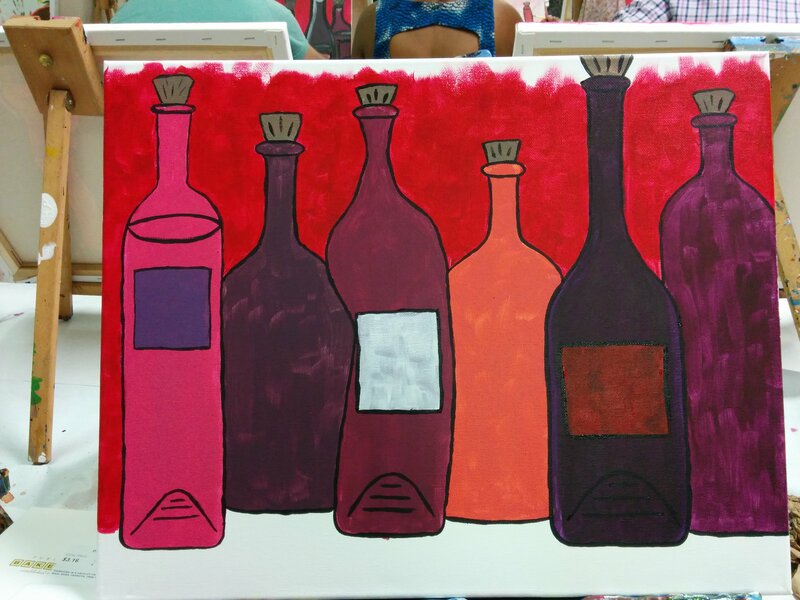 first things first (after getting our aprons and canvases, of course) was to pour the wine! last night’s class was an adult-only event, so bottles were being popped all around the room. we started with some cabernet sauvignon, keeping it ultra classy with my eskimo joe’s cups. don’t want to be breaking any glasses! next we needed the paint so that we could actually make something beautiful. 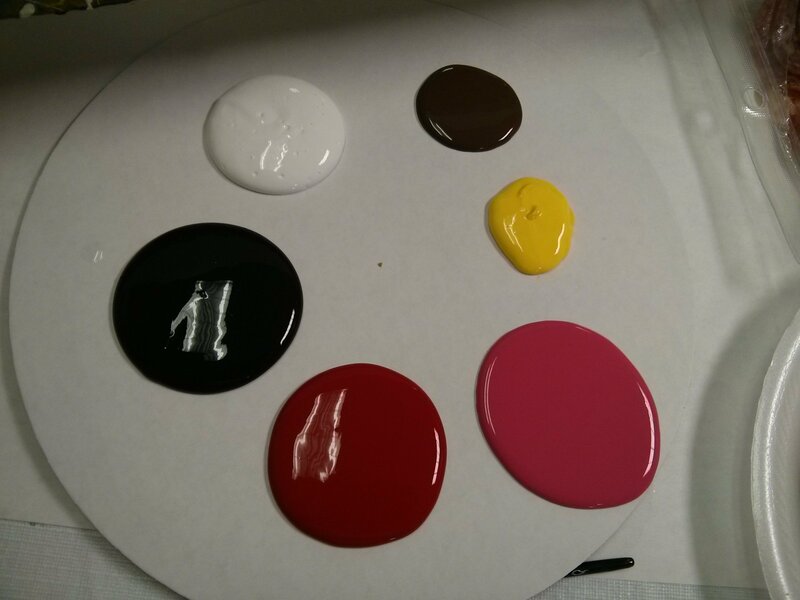 a little white, brown, yellow, pink, red, and black ought to do it! as we waited for everyone else to get settled, we busted open the groceries we’d picked up at publix before we arrived. 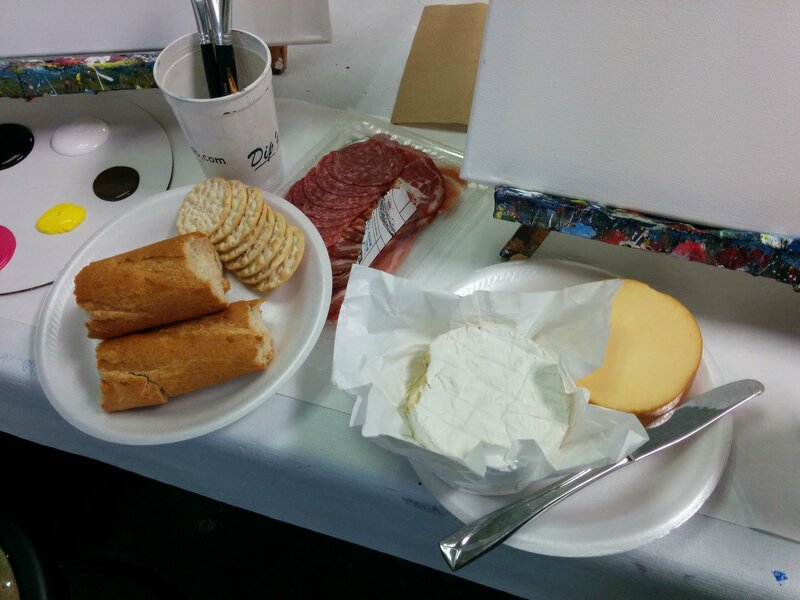 a little gouda, brie, proscuitto, salami, and sopressata paired well with our carr’s crackers and baguette. this night would be quite an occasion! we eventually got started with our brushes and paints since, you know, that’s why we were actually there. 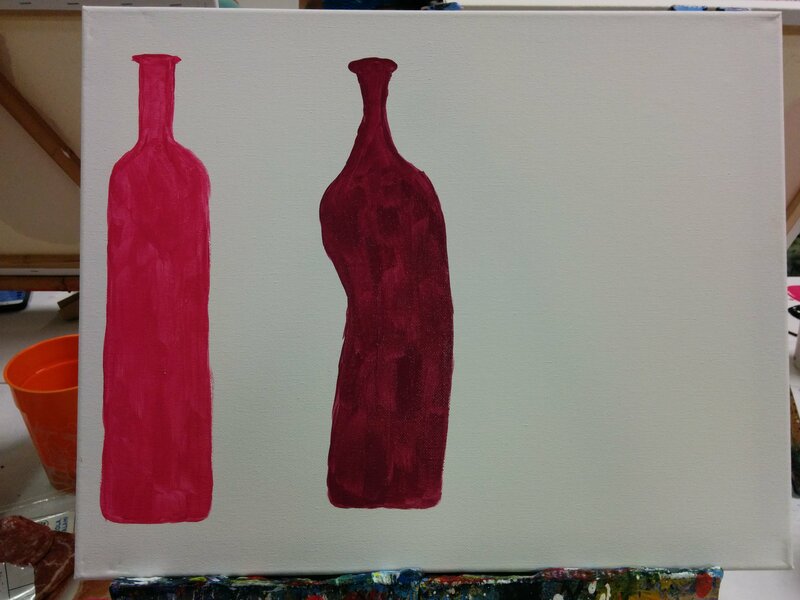 first up was a tall, skinny pink bottle on the left. beautiful! now, we didn’t want it feeling lonely, so we added a tipsy plum bottle to keep the pink bottle company. and then, because everything is better in threes, a large purple bottle joined the crowd. mine was a little genie-in-a-bottle-esque, but hey, diversity is a beautiful thing! 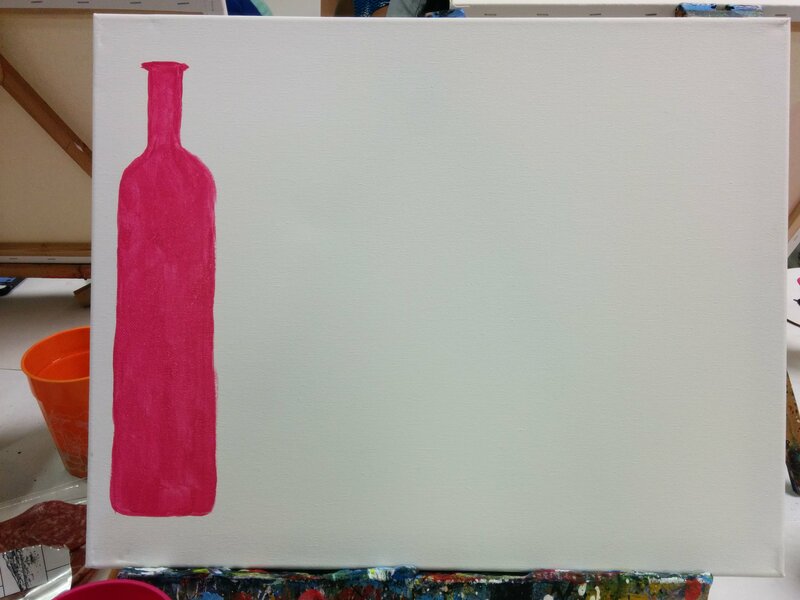 we painted a few more background bottles, and in between color mixing, wine drinking, and food eating, we enjoyed some wonderful slow jams from the jukebox. okay, it wasn’t a jukebox; it was probably just someone’s ipod or spotify playlist, but regardless, we were bumping along to some smooth tunes all night long! 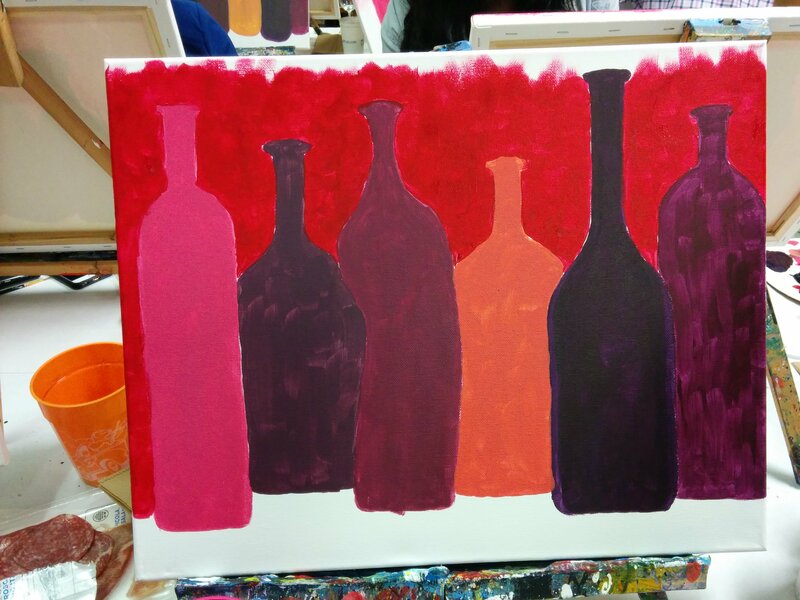 a little bit later we had six lovely bottles set on a dramatic red background. ooh, how inspiring! 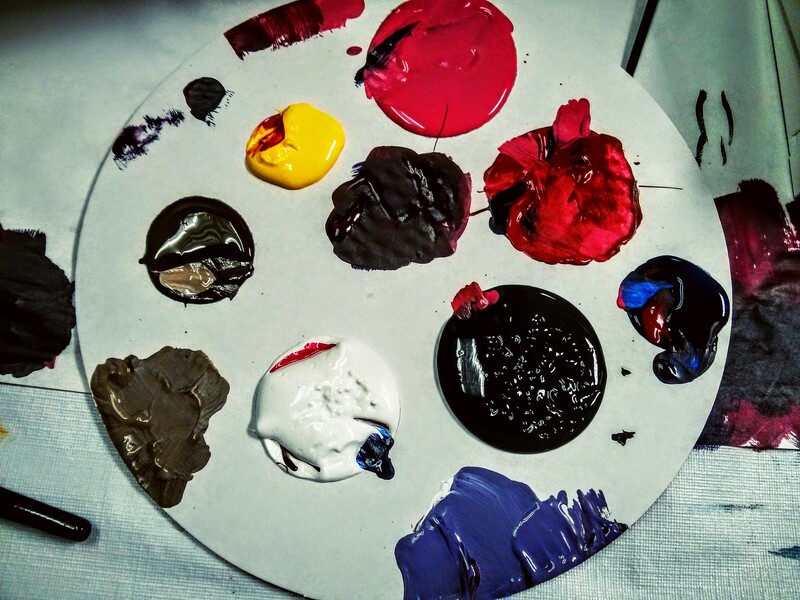 by about this time my color palette was looking quite, shall i say it, artsy? i was a mixing machine, purples of multiple shades and a lovely salmon/peach. mm, get it girl! as the night wore on, we got closer and closer to the final product. a little outlining and corking and we were nearly there! kari poured out the last drop of pinot noir (did i mention we’d opened another bottle…?) to finish out the night. we got in the zone to put on the finishing touches and voila! two beautiful lively bottles paintings were right there before us! it’s like it was magic or something! we were proud artists that night, glad to take home something we created ourselves but even happier to spend some quality time together. with all the distraction in the world these days, sometimes it’s nice to just grab a glass of wine, some paint, and a brush and enjoy a creative and crafty evening.